The Resistance returns with a monumental roster to commemorate Ultra Music Festival’s 20th anniversary in Miami this March. One of the successful staples from recent years, Resistance is ready to take the underground experience to the next level. Presenting the highly anticipated return of their rejuvenated “Arcadia Spider,” Ultra Music Festival and Arcadia Spectacular have once again joined forces to revolutionize the way we enjoy dance music. In 2017, thousands of attendees joined the Resistance “Arcadia Spider” stage, powered by Arcadia, as it delivered a custom production unlike any other. Designated as the festival’s three-day techno retreat, the Spider is neatly tucked away from the MainStage crowd. This year’s headliners include the world’s premier underground talents the likes of Adam Beyer, Carl Cox, Dubfire b2b Nicole Moudaber b2b Paco Osuna, J.E.S.u.S. (Jackmaster b2b Eats Everything b2b Skream b2b Seth Troxler), Jaime Jones, Joseph Capriati, Maceo Plex and the return of the Sasha & John Digweed project. Countless more acts will be dispersed throughout the MegaStructure as well as the Arcadia Spider over the course of the weekend. Many of last year’s artists reappeared to headline Resistance, as well as a plethora of fan favorites just announced as part of Resistance Miami’s first phase. Expect the unexpected as more is still to come. Spanning five continents with Resistance powered by Arcadia, Ultra Music Festival has become synonymous with stellar production at each of their worldwide events. Miami will get yet another taste of the Arcadia Spider, which aims to be bigger and better than previous years. 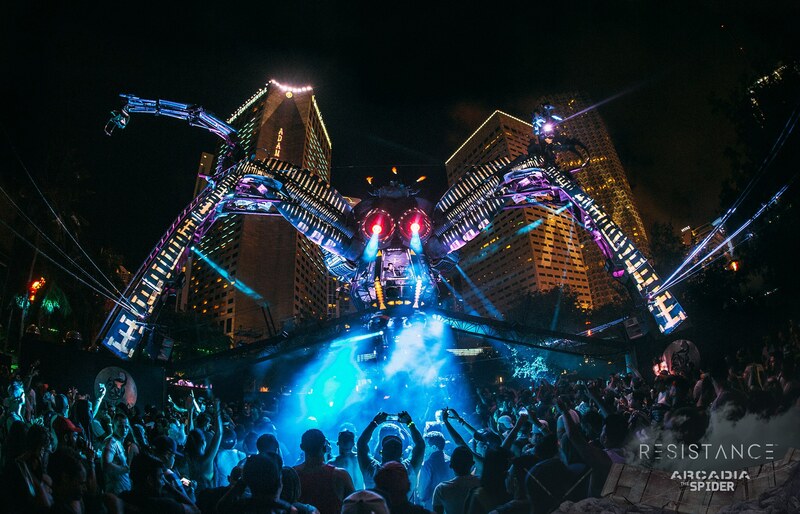 The fully functional Arcadia Spider is complete with endless pyro, lasers, and acrobats, as it immerses festival-goers in the one of a kind experience. Check ultramusicfestival.com or resistancemusic.com to be a part of the action in 2018 as 3 day passes are already 90% sold out!